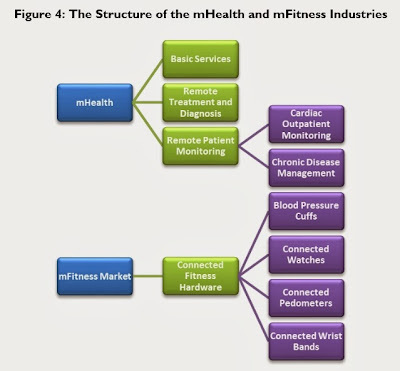 Underpinning the emerging mHealth and mFitness markets are two sectors, healthcare and health & fitness. The trends in those two industries define how the adjacent mHealth and mFitness markets develop. Together, they form the basis for a multimillion dollar global market opportunity. The next five years will see a major shift towards smartphone-based mHealth, where hardware attachments link to companion app on the smartphone, according to the latest market study by Juniper Research. They now forecast that by 2018 there will be 96 million users of app-enabled mHealth and mobile-fitness hardware devices, that's up from 15 million this year. In the healthcare sector, app-enabled mHealth will be used to provide services ranging from remote patient monitoring to mobile ultrasound services. However, the market study found that it will be the mFitness sector that will experience strongest growth in the short and medium term. This growth will be driven by a motivated target market -- an increasing demand for lifestyle consumer applications and a diversifying array of attachments. App-enabled mFitness will therefore reach maturity much more quickly than smartphone-based mHealth, though it ultimately represents a much smaller market in terms of both users and revenues. Importantly, mFitness will be the trailblazer of new technology innovations -- it will also serve to educate the wider market as to what is possible through smartphone attachments. "As mobile fitness devices become more widespread, they will pave the way for more critical mHealth services delivered through the smartphone,” says Anthony Cox, associate analyst at Juniper Research. While mHealth and mobile fitness are two discrete markets -- with divergent audiences -- increased usage of the former will stimulate wider awareness of the latter. Juniper Research forecasts cumulative cost savings from remote patient monitoring of up to $35 billion over the next five years as the healthcare industry moves towards accountable care. Well-documented trials illustrating both health and cost-benefits crucial to convince stakeholders of the value of mHealth. Aging populations and the increased prevalence of chronic disease is forcing healthcare stakeholders to reconsider how healthcare is addressed in both developing and developed markets.